According to Albert Penello, senior director of global marketing for Xbox 360: “It is thrilling to bring the exclusive ‘Modern Warfare 2'-inspired Xbox 360 console to Call of Duty fans”. Thrilling is exactly the word which applies here to refer to the recent announcement about the new Modern Warfare 2 limited - edition of Xbox 360. 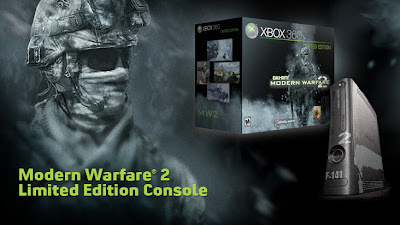 Microsoft and Infinity Ward announced a limited edition “Call of Duty Modern Warfare 2” bundle in Los Angeles on Tuesday. 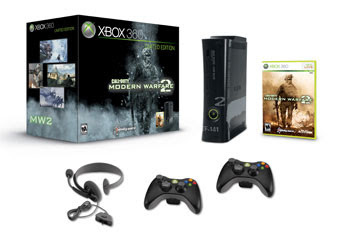 Aside from the actual gaming console itself the bundle also includes a copy of Infinity Ward’s “Modern Warfare 2", two black wireless controllers, a 250GB hard drive, and an Xbox 360 headset. 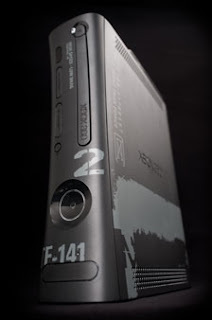 The design was inspired by the blockbuster sequel to the best selling first-person action game in history “Call of Duty - Modern Warfare 2”, therefore Microsoft wanted to "make it look like a piece of military equipment" as an Infinity Ward spokesman said in a promotional video on Microsoft's site. The Modern Warfare 2 console is black and features a prominent "2" on the face of the device. Elsewhere on the product are different markings to keep the “…meaning to the game." The price would be $399 and will be released on November 10--the same day Call of Duty Modern Warfare 2 hits store shelves. It would be awailable for purchase in Europe, the Middle East (UAE, Saudi Arabia), UK, US, Canada, Mexico, Colombia, Chile, Australia, and New Zealand.